A lot of people intend to meditate every day. But not many people actually meditate every day. I realized that if I wanted to meditate absolutely every day it was never going to work if I “intended to” meditate. I needed to just do it. And in order to just do it there had to be an absence of choice, in a positive sense. Whenever there’s any process of deciding “will I or won’t I meditate today” then there’s inevitably going to be a time when we’ll decide “nah, can’t be bothered,” because inherent in having to decide is the notion that meditation is an optional extra. Or one day you’ll just forget to even think about whether or not you’re going to sit. So what I’ve done is to make meditating daily just “part of who I am.” I no longer have to choose. I don’t have to decide. It’s just going to happen. I wonder, in fact if part of the difficulty with getting ourselves into a new habit is that we elevate the idea of choice so highly. It’s hard to frame “not having a choice” as a positive thing. (Of course we always do have a choice — it’s more in whether we see ourselves as having a choice.) But we can either keep the choice open, and not meditate regularly, or remove the sense of choice, and do it regularly. You can’t have both. Because we elevate choice so highly, and equate it with freedom and happiness, we tend to assume that seeing ourselves as not having a choice is going to lead to unhappiness. But in fact, choosing not to have a choice has made me much happier! 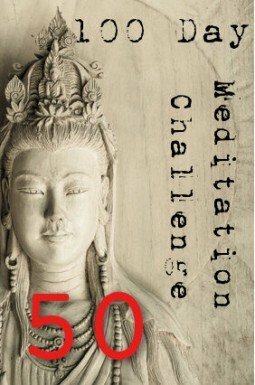 I’m happier if I meditate every day because the meditation does me good (and the cumulative effects of meditation seem to be more intense with daily practice), but I also no longer have to face any sense of regret due to not meditating, and I don’t have that horrible “will I or won’t I” feeling when you’re caught between two conflicting impulses. I believe that in psychology they call this “binding.” You choose not to have a choice, so that you’re more likely to do the thing that’s most beneficial in the long term. You “bind” yourself to the long-term good. The thing is, part of you already wants to meditate every day. Other parts of you want to have options. You can’t please both factions at the same time, but if you do meditate every day you’re doing what’s best for you in the long term. And those choice-hungry factions soon quiet down. The mantra’s not a magic wand. You can’t just say it once or twice, half-heartedly, and assume that the words will make things happen. You have to say it like you mean it, and you have to say it often. And you have to say it as a support for the part of you that does want to meditate every day. And you have to think through how you’re going to make it happen. It’s been interesting seeing how many people have taken up this “mantra” and found it to be beneficial. I’ll be interested to see how you get on with it. Thank you for applying the idea of binding to meditation. I love the idea of choosing not to have a choice in certain self-care situations. I’ve told my health care practitioner I am going to use meditation instead of more medication for my stress related high blood pressure, I just don’t know how to begin. Is there a way to connect with instructions or some kind of help? Much of this site consists of meditation instructions. Click on the “meditation guides” link above and you’ll find details of the structured guides to meditation that we offer. Guided meditation CDs or MP3s are also very useful. We have a selection of those on our online store. This is a great concept and meaningful in that it can apply not only to the practice of meditating but developing a regular attitude towards mindfulness as well. If who you are is someone who meditates everyday then you’re a new character who is fully devoted to being mindful as well, making this a really worthy conviction. Thanks for this really helpful practise idea. As one who often falls off the path of regular steps with meditation I am going to apply this affirmation and remove the burden of choice. Much appreciated.